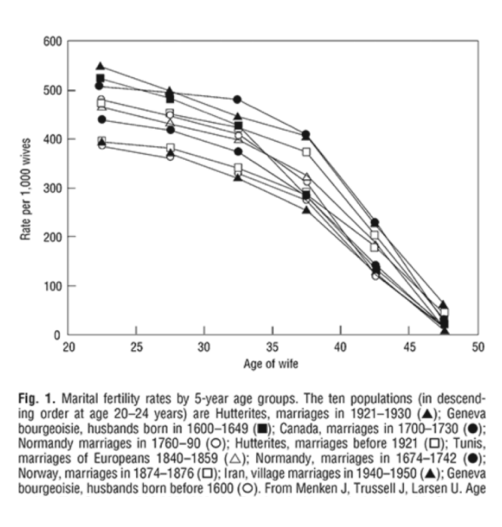 At this point it might be beaten into your head that women’s fertility potential declines with age. That’s true, but here’s the problem: we have surprisingly little credible data on how quickly fertility dissipates for women in the general population. This makes it incredibly difficult to use age to predict with any accuracy whether you’re likely to need IVF, especially during a woman’s thirties and early forties. Much of the data is sourced from the 1600’s and 1700s. The average life expectancy at this time was 30 - 35. Given this, it’s highly possible women in their 30’s and 40’s produced so few children (as indicated in the chart) because many were nearing the end of their lives or already dead. The methods for data collection in the 1600s and 1700s were crude and the computational tools to isolate out variables did not exist. This is all to say that if you’re 33 today, and don’t see yourself having kids before 38, we don’t have any good data to show you about how much harder it will be for you to get pregnant naturally at that point. What we do have is a lot of data showing that for women who needed to use IVF to have babies, their success rates declined significantly with age. This data tells us why doing IVF with younger eggs is helpful, but there is no proof it reflects the patterns of the general population trying to conceive naturally. In short, age, on its own, isn’t a perfect predictor of whether you’ll need to use medical assistance at a given point in time to build your family, but it does show us that if you become infertile, treatments become much less effective with age. There are a few tests that are generally marketed to women as “fertility predictors” or “egg counters” that will reveal the secrets of their ovarian reserves. The most frequently mentioned is the AMH, followed by the FSH. These tests can be very helpful in predicting a woman’s response to fertility medications, if those medications are needed (which generally happens after a couple has tried to conceive naturally for a year). What they do not give us is a prediction of how fertile you are naturally, or how likely it is that you will struggle or get pregnant easily if you try at some point in the future. Below is data from one study showing that women of varying AMH levels conceived naturally at a similar rate and after a similar number of attempts. While this study suffers from two weaknesses (low sample size and an endpoint that is not “live birth”), the data is persuasive. Women are often spurred into egg freezing based on learning they have a low, or a low-end-of-normal-range AMH. What AMH will give you is insight into how an egg freezing cycle will go if you choose to go that route -- if you have a low AMH, expect to collect relatively few eggs, and feel the need to do several cycles to collect an egg number you feel confident in. If there are reasons you believe you’re likely to need IVF at some point, then freezing eggs is a compelling option -- eggs frozen now almost always have a better chance than eggs collected in later IVF cycles. Identify whether you’re someone who’s more likely to need to use IVF to conceive later (for example, if you have blocked fallopian tubes or have a partner with male factor infertility).